When you have created a Test record, it is useful to make the test visible on its parent element. You can do this by displaying the test within a Test Script compartment on the element as it displays in a diagram. Any element that is capable of displaying a compartment, and that has a test assigned to it, can show test scripts in a diagram. Open a diagram containing the element with the attached test items. Double-click on the diagram background to display the diagram 'Properties' dialog. Click on the 'Elements' tab. In the 'Show Compartments' panel, select the 'Testing' checkbox. 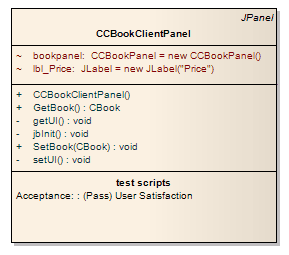 Each test now appears as an item in the test scripts compartment of the diagram element.